WHY DIDN’T YOU BRING LUKE? 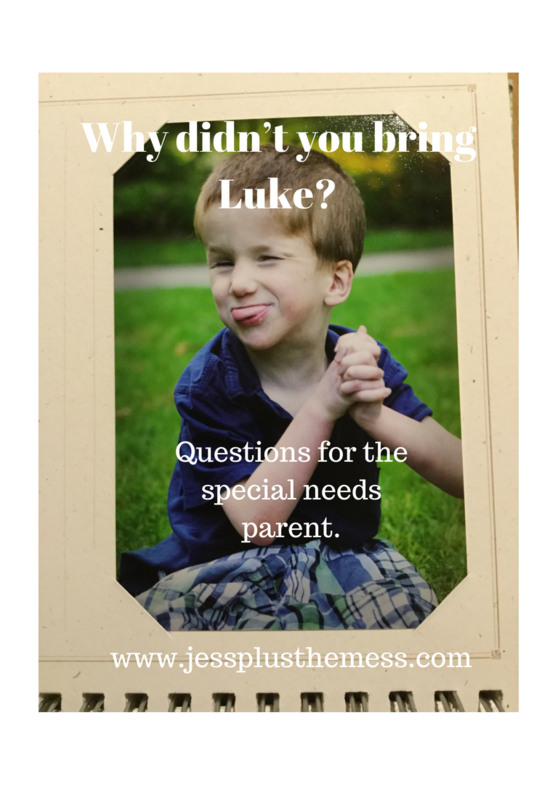 As a family with a special needs child, we often hear this question from well-meaning folks, and there’s not a simple answer just like Luke is not a simple child. Luke is my severely handicapped son, and I love him dearly. I have fought for him to have the best he can possibly have in his circumstances. I have gone above and beyond to make sure that he is comfortable and stable in life because the truth of Luke’s world is that he does not live with mild handicaps – he lives with major handicaps – handicaps most regularly functioning people will never understand: physical, mental, and emotional limitations along with lacking in gross motor skills. Even I, his mother, don’t fully understand at times; however, I allow for the fact that I don’t understand as I seek to make his world one full of stability and love. At a routine twenty week appointment while pregnant I was told that his brain was so full of cerebral spinal fluid that I should consider abortion because it was highly unlikely he would survive, and if miraculously he did, he would probably die in my arms. Luke and I have been fighting ever since. Luke is now fourteen years old, a complete miracle who continues to shock and amaze even the most skeptical of experts. His brain continues to develop. He continues to progress. His eye sight is better than anyone would have ever predicted. He has begun to say a few words; however, even with his continued progress and accomplishments, Luke is still and will always be a much more difficult child to care for than my other children are. He is a fourteen year old in diapers. Full time diapers. He can speak a handful of words to get his point across such as more, all done, juice, and eat. He walks, with assistance, but not for long distances. He becomes extremely agitated with any new experience such as people, environments, foods, or videos to name a handful which make exposure to anything new a tiring and exasperating experience for his immediate family. When I say he becomes agitated, I mean specifically he screams “ALL DONE!” until the new is replaced with something old and familiar which is why taking Luke anywhere is an overwhelming task for all involved. We do attempt to integrate him into limited family activities but not so much for him, but for our peace of mind as his parents and for all the others who ask the question, “Why didn’t you bring Luke?” We (his family and society) need to feel like we are including him when the reality is he would be much happier and more content in his familiar environment at home, walking outside, eating lunch in his reliable chair, and retreating to his den of safety, his room, to watch one of his beloved videos. Recently we included him in a two hour family Easter egg hunt at church. We packed his bag, diapers, wipes, sippy cups full of apple juice (the only beverage he will drink), a change of clothes, and his wheelchair, along with our six other children. We loaded him into the van which was confusing and disorienting for him because he associates the van with going to school, and then we proceeded to hear “ALL DONE!” screamed at the top of his lungs for the half hour drive to the church. When we arrived he was content as long as one of the parents (not his siblings) was walking him along the track that encircled the field where the hunt was occurring (so, no he wasn’t participating nor was that parent participating) or eating skittles which he happily discovered when one of his siblings offered to share a package with him. A package turned into about 20 packages within an hour as the “MORES!” grew louder and more persistent. We left with a green/blue/red (he spit out the orange ones) juiced monster, skittle juice in his hair, clothes, face – every visible body part, on our hands. Good thing we had wipes in the bag. In order to keep him pacified on the car ride home we frantically stopped at McDonalds to pick up food and then fed him, slowly, bite by bite lest we hear the dreaded “ALL DONE!” or worse yet, ear piercing screams for the thirty minute car ride. Once home, we hosed him down, again, with multiple wash cloths, scrubbed the entire bench seat in the van (which still has remnants of ketchup and mustard forever etched into the fabric) brought him to his room, closed his bed, and popped in a video which he was entirely too happy to see. Then we all breathed a huge sigh of relief. That’s our reality with Luke for about two hours. Imagine an actual family vacation with him, in our travel trailer, or worse yet, a hotel room. My late husband and I tried the hotel room once, and it was enough of a disaster for us to vow never to make that mistake again. We took two year old Luke and his older brother Caleb on an overnight trip to Frankenmuth, Michigan, the Christmas city, full of joy and happiness and for our family, full of incessant screaming from a little boy who was not at all in the holiday spirit. Luke was so distraught at the change of environment that he repeatedly screamed throughout the day and night, banging his head against the pack and play, bloodying his face, until we finally gave in and gave up, packed the family’s belongings at 1:00 am and drove the two hours home because he would not stop disrupting the entire hotel. I appreciate people’s intentions but what I want to say is this: if you do not have a special needs child you cannot understand. We, the parents don’t even fully understand at times! Most of us are doing the absolute best for these children, and it is difficult. Our patience runs thin. Our mental stamina wears down. We beseech the heavens for answers and finally succumb to the knowledge that God is God and we are not and for some reason we were given the sacred responsibility to raise these special kids beyond our understanding or comprehension. We love these children from the depths of our souls, but you stranger (or friend or teacher or family member) need to understand that as their parents, we understand things about them from the depths of their souls that most cannot, nor will not, ever understand. I know Luke associates me with Veggie Tales. His own mother. When he sees me he breaks out into singing a Veggie Tale song. This stems all the way back to when he was one years old. He also associates me with the song Amazing Grace which I sung to him every day while he was in my womb and then again as I rocked him for two weeks in neo natal after he was born. Luke associates me with the crocheted blankies I’ve made him throughout the years and with counting each and every step that we walk up as we exit his room to the kitchen. Luke doesn’t enjoy it when people love on him, hug him, kiss him, or cuddle him, never has, never will. You can, if you need that for you, but it annoys him. He doesn’t feel loved through those actions. Luke experiences love through chocolate cake, or brownies, or singing songs, or doing goofy paddy cake with his feet. I know this about him; I’m his mother. I know Luke hates new and to bring him somewhere, on a family vacation, is not loving for Luke, it is actually borderline abusive to not only him but to his entire family. We can’t explain to him why his entire schedule has just been uprooted in an instant, and he can’t explain to us why he’s so upset so instead he screams and screams, the only form of communication he knows for his angst. We owe ourselves as parents the comfort of getting away occasionally without the added stress of a child who doesn’t even want to be there. We owe that to our other children, and most importantly, we owe it to Luke. That’s why any resources which are available to help families such as ours or others are so greatly appreciated and pursued, especially in times of much needed respite. That’s why we need more resources such as day camps, respite care centers, equipment, and especially trained people to help with these children. Ryan and I often discuss what the future holds for Luke. We’re honestly not sure. My motherly instincts want to protect him forever, here in my home, where no one can take advantage of him or harm him. My wifely instincts are also really excited for the day when all the kids will be out of the house, and my husband and I can enjoy each other’s company traveling the world. I don’t know what Luke’s future looks like, but I have about four years to get some sort of loose plan in place for him. My ultimate desire looks something like a faith based retreat type of living quarters within twenty minutes of my home – not a very probable or viable option anytime in the near future. I don’t necessarily want to be a full time caretaker for my twenty year old son, but I’m not sure I’ll be comfortable placing him in a state run facility either. I also envision him attending a learning facility by day (physical, occupational, and speech therapies) and coming home at night with an aid to help us and him. His future, especially where we live now in rural Tennessee, concerns me because I’m not sure what my options are. Families with special needs children just want the best for their children. We want them to be safe, have fun, and to be comfortable, and we need more options, especially in rural environments, to make these hopes and dreams a reality not only for these special children but also for the families that have been entrusted to care for them. How It Came To Pass That We Were Granted Ten Minutes Of Fame. You are a wonderful mother to Luke. I am so lucky that I get to know this little man. He really does light up my week. I hope that you can have everything you want for him plus some. Sending my light and love! Amen to that…. What a wonderful article and well said! I found your article on your “journey” on facebook. So glad you found your husband! Sounds like you have an amazing family. I have an 11 year old with a lot of special needs. I too, found out when I was 20 weeks pregnant and they asked if I wanted to abort. He has brought so much love to our family. He is such a joy…. But also a handful. I feel I am in the same shoes as you are when you were writing that. I understand. You are not alone. It’s hard as a mom to not include a child, but it is necessary. My some Evan does not enjoy many activities and it wouldn’t be fair to him. Also, once in awhile it’s good to get out and do things for the other kids too. They deserve that. Keep up the great work and good luck with your family. Thank you for sharing your story…. What a beautiful story! Thank you for sharing your hope and strength with others!!! I have a special needs son–much more mild than Luke’s needs. But I’m also a pastor’s wife and quite often I have to explain why we can’t be somewhere or why you can’t help us with Ian. He’s better now than when he was a toddler. At least now he has language and some understanding, but it’s still hard. Thank you for your honesty in your post. You know and I hope those around you who love you know–that you do what is best for Luke! Try not to listen to the other opinions. Great post. And a touching reminder to the rest if us. Have you heard of Cornerstone Ranch in TX? Here’s a vid, maybe it’s a good place for luke (in the years ahead). You may have already heard of this, so no worries if you have. A family friend lives there. I so appreciate your thoughts on this- as a special needs aide I saw this play out on “special” days like field trips and Special Olympics- some of our students were so stressed out by the changes they were just miserable. It really did feel abusive to put them through it and I knew in my heart they just wanted to go back to the classroom and have a regular day. It is hard for others to understand the dynamics of a person not wanting new and exciting and different but there is a respect issue of knowing that they just want their normal day. Your son is blessed to have you as a mama who sees him way down deep and tries to make each day a good day for him. May your words help people understand the need to value and acknowledge each person’s comfort zone. I often wonder what has happened to many of the students I worked with in other states I lived in- as they are in their 30s with older parents. I hope you find a place or assistance that is right for you and Lucas. Thanks for writing. Thank you for sharing. And I do very much understand where you are coming from, not from a mother’s perspective, but from an auntie’s. My nephew is special needs too. And I too understand how he’s much more at peace in his room, with his routine, and same everything around him. Same people. same toys. Same everything. Uprooting him from his world is borderline cruel. I admire your love, patience, but most of all, faith. And your life seems one to be lived vicariously for others: full of life, happiness, love, and even grief. The latter is what makes us humans. This is a beautiful post. I’m sad that you felt the need to write it and try to explain, but I also think that it may help many understand for you family and for others. I do not have a special needs child, but working with special needs’ children has been my life’s work. Part of that, included providing respite care for children when their families were away. I admit that during those first few weeks, I didn’t always understand what you explained above, but it took only a very short time to understand how absolutely essential it was for all involved. The children I primarily provided respite for, were children who desperately needed the safety of a precise routine. Even while caring for them in their homes, I needed to know the details of their routine and what brought them comfort or risk causing them a great deal of anxiety and confusion. Slight variances that at times, were necessary, required a great deal of planning and attempt to help the child understand. Even then, those occasions often resulted in extreme anxiety for the child. For whatever it is worth, I completely support your decisions to Luke a place of safety and security while also providing for your other children, who each also must have their unique needs. Reading you post is beautiful to me. I read it and see a mom who loves and provides well for each of her children, understanding each of their needs and providing well for them. You and your husband have my heart. Not only do you have a special needs child- but both of your journeys with brain tumors. I have a 10 year old son who had a brain tumor. It was removed through a a craniotomy when he was 15 months old. Day three of recovery we almost lost him- only because the nurses hadn’t adjusted the spinal tap settings. He is now a very healthy, ramboxious, video game playing 10 year old. Everyday I thank God he gave us more time with Garrett. I wonder why he chose us to go through this- and then I also wonder what makes us so special to get to keep him. I constantly feel guilty for these thoughts and questions, but I know Garrett will grow up to be something amazing. You both have a special place in my heart. Congratulations on the new life, and your new addition! How exciting! I’m envious of your big family! All your kid will forever be grateful they have all those siblings! Good luck and know you are doing an AMAZING job with ALL your kids! Thank you! My son with special needs passed away earlier this year, but this is exactly how I felt about taking him out. People wanted us to know he was welcome, and that was nice, but we often left him home with a caregiver when we went out. It’s a tricky balance: what would he get out of it and what would his level of discomfort be, along with how much or little his being there might take away or add to everyone else’s experience. You wrote a great explanation! Lovely story. We had a special needs child in our family growing up. It was very hard. I do remember that as she got older and the mother, aunts, etc, got older and died off, my uncle came up with a plan. It was very hard, but had to be done. She was placed in a nursing home, not all are willing to accept Downs children. You have to remember, she had never been to a school, because when she was born they didn’t even have schools like that. Well, anyway, she was very happy in that home and it was close enough so that we could visit. It was the best move and the only possible move to make at that time. She passed away at the age of 70 about 10 years ago. But, I often wonder, what would have happened if my uncle had not made that decision. May God bless you. Whatever you eventually decide, it is nobody’s business except your own. Hi, I’m new to your blog after reading about your marriage, and I just wanted to say that I think when people ask you why you didn’t bring your son along, it is so you would know he was welcome in their home or at their celebration. I think we never want parents of special needs children to feel that we are annoyed by their children’s behaviors or special circumstances. So, while I understand your child’s need for stability, and your need for a break, I hope you know that this question is not meant as a criticism of you. I just a read your story on KSDK from St. Louis. God has plans for each of us. I am so happy for your family. United as one with Gods miracles. God bless you and your family.